The path by which BC has arrived at a new curricular landscape for Social Studies has not been a straight one. Like other areas of the redesigned curriculum, there have been both frustrations and pleasant surprises. Many teachers have expressed concern over the loss of Social Studies 11, considered a "flagship" course due to it's emphasis on the world wars, a changing Canada in the 20th Century, and meaningful exploration of politics, government, climate change, and global population and development issues. Other teachers have expressed concern over the elevated status for history and historical thinking within Social Studies and the resultant (perceived) demotion of geography in particular -- in my opinion it was not embedded strongly to begin with. Delays to implementation have caused frustration (how many times can we teach SS11 to students who have already sat the same material in SS10? ), as have the confusion over whether electives should be designated as Grade 11 or 12 or both. The proliferation of choice and flexibility, once touchstones for the BCED Plan, are now seen as fragmentation and indecision. So what do we do about it? It is my belief that the chaos introduced by the planning and implementation process over the last few years will amplify some of the strengths and weaknesses that currently exist. We have teachers who are not yet ready to teach their subjects, who have come to rely on worksheets and modules (usually not their own) or a series of disconnected projects. We also have teachers who have intense passion and knowledge for certain topics or methods, some of which were closely tied to pre-existing course structures and titles, some of which were never fitted to the courses to which they were assigned. For better or worse, the revised curriculum offers a window of time in which teachers may indeed write their own narrative into the curriculum, to shape the very contours of their teaching practice, and define big ideas, competencies, and content in a way that resonates with their core values as educators. This is, of course, both dangerous and exhilarating, and will result in as much bad practice as it does success. 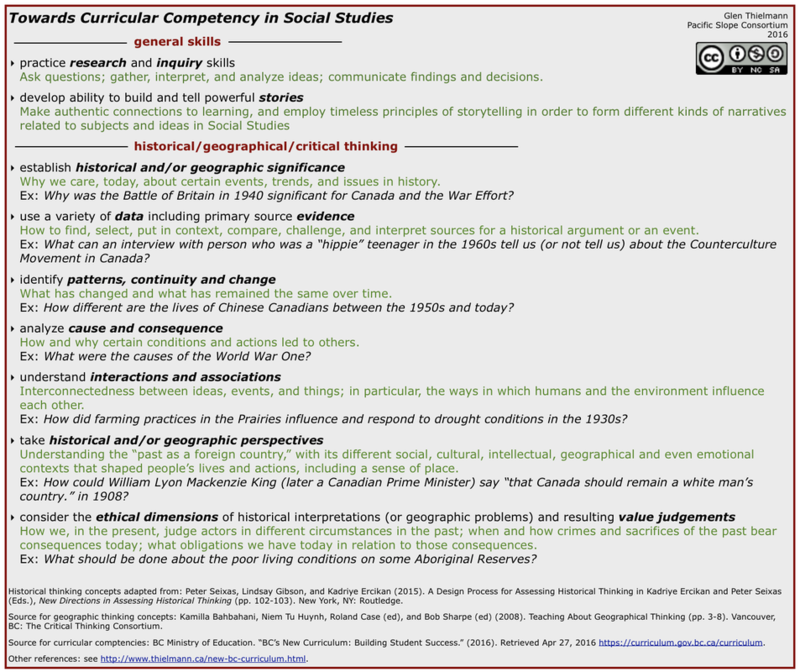 These 11x17 pdf documents provide some ideas for 2016-17 Social Studies courses that reflect the new role for "competencies" and the shifting content in the new and draft curriculum posted at https://curriculum.gov.bc.ca/. The topics are moving between grades because the historic start and end dates for Social studies have changed (in addition to other changes to the curriculum by the Ministry of Education). These charts are intended to help teachers figure out where (and if) they wish to repurpose existing lesson material and learning resources. They are not meant to identify lists of topics that all have to be taught (or learned! ), nor do historical topics and sequences need to be the main basis of new course designs. There are also many other fresh topics and perspectives that can enter into each of the new courses in service of students’ development of skills, progress towards discipline-specific competencies, and understanding of the big ideas. Further, a historical "design lens" should not be the only way to conceive of social studies. In BC we have the privilege of an subject area that is already interdisciplinary in nature and we should take advantage of this in our design for learning. Document 1: New BC Curriculum and the Old Familiar Topics: Overview of Content Shifting in Social Studies 7-11 - An overview of curriculum change. Document 2: Suggestions for building a new Social Studies 8 Outline - The relationships that guide the development of civilizations and identity of people. Document 3: Suggestions for building a new Social Studies 9 Outline - Why Canada? The growth of peoples and a nation in a continental and global context. Document 4: Suggestions for building a new Social Studies 10 Outline - The course every Canadian should take. Are we too big for our planet? Why bother Voting? Is there such thing as a Canadian Identity - where does it come from, who does it represent, and how is it expressed? Prince George teacher Kim Rutherford has been provided with some time from School District 57 to support English and Social Studies curriculum. He has curated a variety of useful weblinks for teachers on his website. Books on Teaching and Assessing the "Big 6"
Blog post: Some discussion and Q & A about my sample Social Studies 9 outline. Blog post: Making the case for Storytelling as a Curricular Competency. Situates storytelling at the center of critical thinking, authenticity, identity, and the First Peoples Principles of Learning. Kelley Inden's pilot of the new SS9 at the Messy Professional blog. This is an inquiry-rich approach from a thoughtful teacher in Ft. St. James. Rather than survey the broad SS9 curriculum (it has more potential topics than ever before! ), the class sampled the curriculum, made many modern connections, and focused the inquiry on an essential question. The idea here is to tweak the published BC curricular competencies to foster a more holistic approach to Social Studies. This involves placing "geographic thinking" alongside historical thinking. The two sets were not so far apart to begin with -- arguably based on the same 6 (or 7) basic critical thinking elements -- most could simply be embedded. While "cause and consequence" and "interactions and associations" are similar, I have kept them separate in order to distinguish between inquiry that looks at direct connections between events and phenomena and inquiry that explores interconnectedness and dynamic exchange. I've also provided (adapted) some examples and included storytelling as an over-arching skill alongside inquiry processes. See the file for references.